Photo. Lions surprised us in the morning. It was like taking a ice cold shower. © Travel Explorations. Here we were stood in a remote area in the Savuti Channel in Botswana, which is a legendary wildlife region, and well known for its large number of predators, especially lions, and now we were in big trouble. Was there a way out? This dramatic incident happened in 1996. Far away from the modern world in Botswana, which is located in the southern part of Africa, the nature is collared by savannahs, deserts, wetlands and salt pans. In this environment you can find the richest animal life you ever had dreamed about, included predators as for instance lions. We got a transfer from Chobe Game Logde to Kasane Airport for a flight on to Savuti. In a small jumpy 5 seated aircraft, we flied over the green area and finally landed in the middle of the wildest jungle. If you want to stay where the wild things are, Savuti Channel is definitely the place to go, especially to a place called Savuti Bush Camp. This a small camp located in a private concession along the Savuti Channel, about 10-km down the channel from the source of the Savuti. It said to be one of the best areas in the country to observe predators. Based on my experienced from the camp I have to confirm that. It is fascinating, but it always risky to see exotic animals in their natural habitat. When you meet wild Africa on its own terms there is not easy to keep the control, especially not regarding safety. It all started when my travel mate Geir had to do some urgent personal things outside our tent early one morning. When he sat down on a kind of toilet, the mosquitoes sting and the flies bite him. After a while he heard noises up in the trees, and then he knew that something exciting was going to happen. My friend looked around and noticed that a group of lions had flocked around him. Probably the diry smell kept the lions away for a while, but they continued to move slowly towards him, and in the last moment he jumped into the tent again. Suddenly we heard a scream from our neighbour's tent. When we looked around we could see lions over everywhere. Good advises costs a lot, says an idiom. In this case we really needed good advises. But it didn't take long time before we understood that the best thing to do was to stay calm in our tent. We had to postpone the breakfast despite we were hungry. Fortunately the lions went further and moved towards a waterhole 30 metres away from us. After 4-5 hours our excellent guide picked us up. He was well armed and prepared for more surprises. He escorted us to the tent beside us and we were happy to see that the boss on the camp was still alive. He told us that when he woke up and opened the zipper to his tent, he looked directly into a lion's big mouth. There was no need for extra wake up signal after this unexpected encounter. It really shocked him a lot, and he trembled little bit afterwards. We followed the lion`s footprints to the zipper of his tent, and there was no doubt; the one lion had been really been close to him. During the breakfast we had a lot to talk about. I am glad that stayed in the tent this morning or we would probably ended up as a breakfast snack for the lions. Photo. Our guide shows us footprints from a lion who suprised him in the morning. I can ensure you; he woke up really quick this mornning! It was not a nightmare, it was real! Two travelling girls from USA were sleeping in a tent next to ours. They had a good sleep in the morning and didn’t notice anything. One of the guides picked them up in the late morning. He didn’t take any chances and was well armed. When we told them about that they had been surrounded by 30 lions, they just laughed wildly and thought it was a big joke. After the chief of the camp told his story and he showed the footprints of the lions, they become really convinced, but it took a while. I wouldn’t say they got a nervous breakdown, but they started to get itchy feet for going back to the civilisation. Photo: One of the 30 lions. © Travel Explorations. 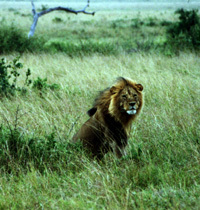 The lion is one of the Big Five in Africa. The lion (Panthera leo) is a mammal of the family Felidae and one of four "big cats" in the genus Panthera. The lion is the world’s third largest cat, after the liger and the tiger. The lion is the largest of African cats and King of the Beasts. The male lion can easily recognized by his mane, and weighs between 150-225 kg (330-500 lb). Females range 120-150 kg (260-330 lb). The lion`s thick mane make the male look bigger and it protects the throat. 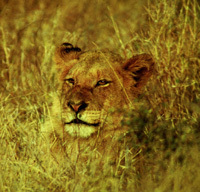 They are not so easy to spot in the dense bush since the lions wear a tawny coat colour camouflage. The lions who showed up were all both hungry and thirsty. Regarding our health we found it best to stay in the tent until tje lions haved moved to other places. We were also hungry and thirsty, but this morning we delayed our breakfest. Photo. Looking out from the tent. © Travel Explorations. Watching lions from the tent is safe as far as you don't stick your nose out too far. Lions tend to hunt mostly by night or in the early mornings. Then it`s especially important to have our eyes open in the morning, and look carefully around before we take our first steps. Lions are least active between 11a.m and 5 p.m, but being opportunists they'll hunt whenever the opportunity arises and that could be the middle of the hottest day. You are never safe when you are close to a lion. Don`t be fooled. The lions seem so calm and nice when they are sunbathing, but they can be incredible fast if you provoke them. They never forget their hunting instinct. I was very aware of that lions are man-eaters, so I would not for a million challenge one of the lions in a fight. Another reason for that is that the lions are known to be very social animals, and like to stay in herds. One lion is too much, but many lions at one time, I would be ripped to pieces in few seconds. No negotiating, no mercy. It’s the law of the jungle. The strongest win, or as the famous British scientist wrote it: The survival of the fittest! The lions often attach bigger animals than themselves as Zebras and wildbeest. Many times the hunt in a group, and that’s very effective. Lions use to mark their territories by urinating, dropping and scratching the ground by its sharp claws. I wondered how we could get out from the tent if the lions here decide to occupy this area for good. Luckily for us the waterhole nearby attracted the lions, so they past us. Anyway the waterhole was no more than 30 - 50 metres away for our tent, so we could not do anything else than just stay calm in the tent. Adapt or die! Our experience with the guides on the camp were absolutely the best, they served good food, guided us on exciting tours and were in general very service minded. First of all they took care of us. That was absolute necessary in this wild world! The chief of the camp was an expert of Lepards, and he told us that he worked with a book about this predator. We are forever grateful for these fantastic days we had together with them. It was an adventure for life! If you would like to go to Savuti Bush Camp one day, you should be aware of that elephants, snakes, leopards, and as mentioned, the lions, walk straight through the camp, between the tents. The animals don't see any borders. So watch up for unexpected visitors. Night drives are also a highlight you shouldn't miss. And then it only remains one thing to say: GOOD LUCK! 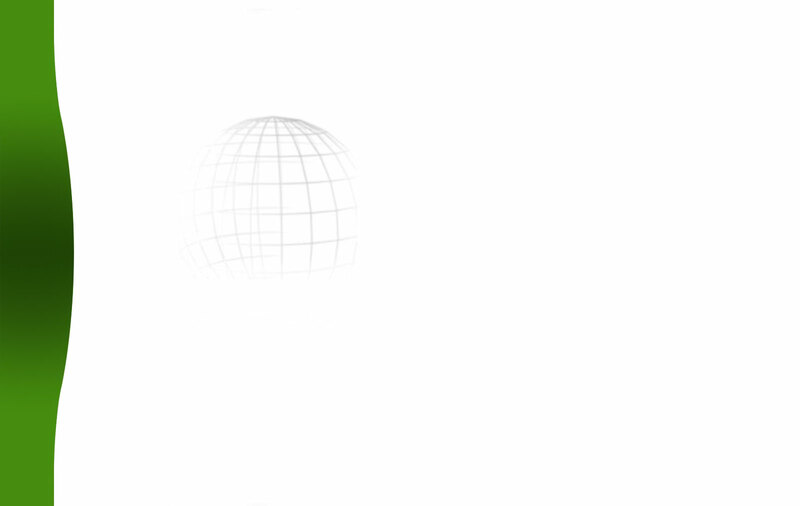 You need it! Savuti Camp is situated in the southern part of the Linyanti Wildlife Reserve, in northern Botswana. 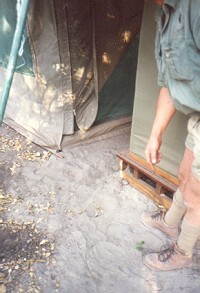 The camp is built along the Savuti Channel, about 17km downstream from the source of the Savuti. After the channel stopped flowing in 1980 and what was a hippo-filled river, is now wide open grassland. Read more about wildlife on our website. Two lions that killed and ate 135 railway workers in Kenya in 1898 may have suffered from extremely painful toothaches that prevented them from attacking their normal prey, researchers said. Over a nine-month period, workers building a railway bridge over the Tsavo River in southeastern Kenya were dragged off and eaten by the lions, which are now stuffed and on display at Chicago’s Field Museum. Read more in the article: Why Man-Eating Lions Prey on People - New Evidence (National Geographic, 10th April 2017). An analysis of the notorious Tsavo man-eating lions' teeth has revealed some surprises. Watch also the trailer from the movie: "The man Eaters of Tsavo".